ZACHARIAS, THE PRIEST,was an old man. All his lifetime he had been in the priesthood, for he was a descendant of Aaron. And he had married a woman named Elizabeth who also belonged to the family of the priests. Zacharias and Elizabeth loved God and lived to please him as well as they knew how. They thought often of the promises God had given to the Jews by the old prophets who lived and died many years before their time. These promises were that some day God would send a Saviour into the world, a son of David, to rule over his people forever. Now Zacharias and his wife had grown old, and God had never given them any children. They had prayed many times and asked God to give them a little son or a little daughter, but their prayers had never been answered. And they had lived alone in their quiet home, thinking that God was not willing to bless them with the joy of parenthood. Still they served him faithfully; for they knew God always does what is best. Zacharias did not always work in the temple. There were many priests, and these priests served in the temple by courses, just as David had planned when he arranged for the building of the first temple in Jerusalem. There were twenty-four courses of the priests, and Zacharias belonged to the course of Abia. When his turn came to serve he left his quiet home in the hill-country of Judah and went to Jerusalem. There he did the work that fell to him by lot. And his lot was to burn incense on the golden altar, in the holy place, or the first room of the temple, where only the priests might enter. Twice each day, at the time of the morning and the evening sacrifices, Zacharias took his censer of burning coals from the great altar and went into the holy place alone to offer sweet perfumes upon the golden altar before God. And while he lingered in that room, the people who came up to the temple to worship stood in the court outside and prayed. This was called the hour of prayer. 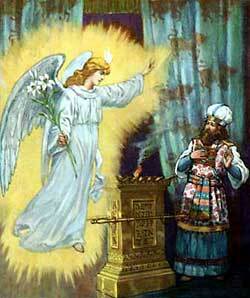 One day while Zacharias was offering incense upon the golden altar he was surprised to see an angel standing on the right side of the altar watching him. At first Zacharias was very much afraid, for he had never seen an angel before. Zacharias listened, filled with wonder as to whether these words could be really true. He thought he and Elizabeth were too old to have a child, and he asked the angel to give him a sign that he might know for sure these things would happen. And then the angel disappeared as suddenly as he had come. The people stood outside waiting and wondering why Zacharias was so long in the holy place. When he came out to them he could not speak, but showed them by motions that he had seen a vision from God. Not long afterwards Zacharias finished his course of service at the temple and returned to his home in the hill-country of Judah, as speechless as when he came out of the holy place. But he knew that the time would come when his voice would return, for he believed the sign that the angel had given to him.